Using a mixture with a paddle attachment, cream butter and sugars together until very light in color (~5 minutes). Add eggs, one at a time, mixing well after each addition. Stir in the vanilla. Reduce speed to low, add dry ingredients, and mix until just combined, 5-10 seconds. Drop in chocolate pieces and incorporate them without breaking them. Press plastic wrap against the dough and refrigerate 24-36 hours. Dough my be used in batches, and can be refrigerated for up to 72 hours. Scoop 6 3 1/2 oz mounds of dough onto baking sheet. (To scoop out dough, use an ice cream scooper, or let it stand at room temperature for ~2 hours or until soft enough to work with.) Sprinkle lightly with sea salt and bake until golden brown but still soft 18-20 minutes. (If dough is at room temperature, bake 10-12 minutes.) Transfer cookies onto wire rack to cool. 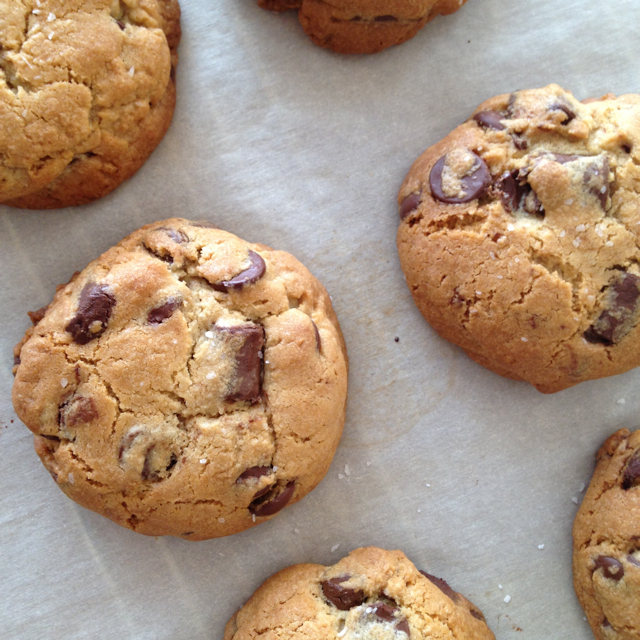 I’ve never seen a chocolate chip recipe with both bread and cake flour…will have to try these!